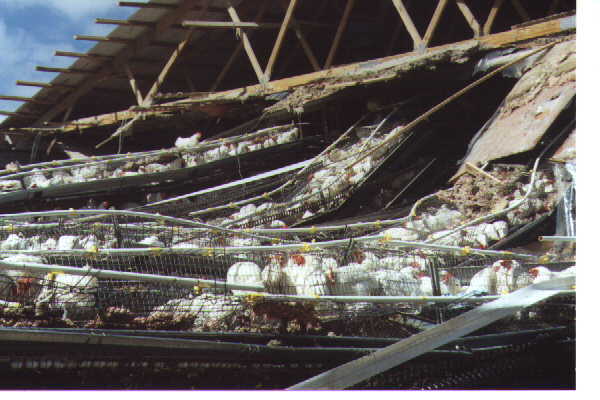 A tornado ripped the roofs off of the metal sheds at then Buckeye Egg Farm*, now Ohio Fresh Egg. One million birds were exposed... one half million died shortly... perhaps 100,000 were rescued.by animal rights groups from Ohio and other states. At least 400,000 were bulldozed ALIVE into graves, AFTER NINE DAYS WITHOUT FOOD AND WATER. The owner of Buckeye Egg Farm had been banned from factory farming in Germany because of the use of nicotinoid insecticides lethal to human beings, and because of animal cruelty. The Republican governor of Ohio saw it as an opportunity to welcome him with a red carpet to start his human poisoning, animal cruelty, and environmental pollution in Ohio. This corporation has been sued for using 6 month old eggs, for using child labor, for creating such a cesspool of chicken waste that Ohio Wesleyan University studies found it had filled neighboring rivers with salmonella. Flies, divinely appointed waste removers, multiplied in the millions. One individual sank to her neck in chicken waste and her life was saved by grabbing onto the pipes overhead. * It was renamed Agrigeneral and then renamed again Ohio Fresh Egg. Other factory farms routinely have power outages during which the metal shed housed chickens roast or freeze alive. Chickens are painfully debeaked with searing machines so that they will not peck each other from the overcrowding, 9 or more chickens to a cage 1 foot by 3 feet. Representative Steve King of Iowa wants no one to tell chicken abusers what size their cages should be. Eggs have 250 to 300 milligrams each of cholesterol. When a chicken has leukemia which profiteers disguise with the name leukosis, it is transmissable to human beings who eat the chickens. The uric acid or trioxypurine in chickens causes arthritis. There have been many reports of these innocent birds being skinned alive in slaughterhouses.